NEW YORK, Sep 8, 2014/ — With Whoopi Goldberg, Andi Muise and NERVO, Stella Nolasco unveiled her Spring 2015 collection bright early on Friday, September 5th 2014 at 9:00 AM at the Lincoln Center. An established womenwear designer from Puerto Rico, Stella Nolasco’s debut on the New York catwalk has been sponsored by the Puerto Rico Tourism Company, as it stands with her vision of fashion. Nolasco’s forte in constructing ethereal yet bold gowns has been commanding presence in the Latin fashion community for years. It is now her time to make waves in America at Lincoln Center. Inspired by the saying ““To each Saint, one candle…” Stella Nolasco experiments with elaborate fabrics made of bright, metallic sequins and sheer, delicate laces this season to add an element of surprise to her feminine pieces. In tasteful pastels and ivory, Nolasco creates exciting, refreshing textures using thick and thin lace appliqués to create form-fitting light gowns that create beautiful movement. Her play on “the visible and invisible” is fascinating to see and interpret with the prevalence of exposed backs and torsos mixed and expertly placed details to maintain lady-like air while having strong character with her daring silhouettes. 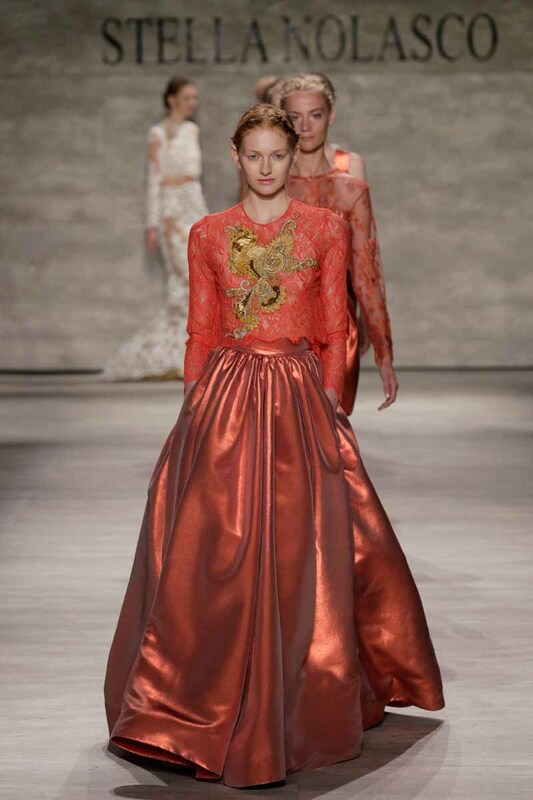 It truly is a beautiful, Spring dream to see Nolasco’s creations walk down the runway this season. This may be her first show in America, but Stella Nolasco is no rookie.